Death and the Afterlife were important themes in Greek mythology, and it is therefore no surprise that a powerful god, Hades, was given dominion over the Underworld and the afterlife itself. There were many other Greek gods and goddesses associate with the afterlife, and even Death itself was personified in the form of Thanatos, the Greek god of Death. Thanatos was the son of Nyx, the Greek primordial goddess of the Night, with the father of Thanatos sometimes named as Erebus, the Greek god of Darkness. 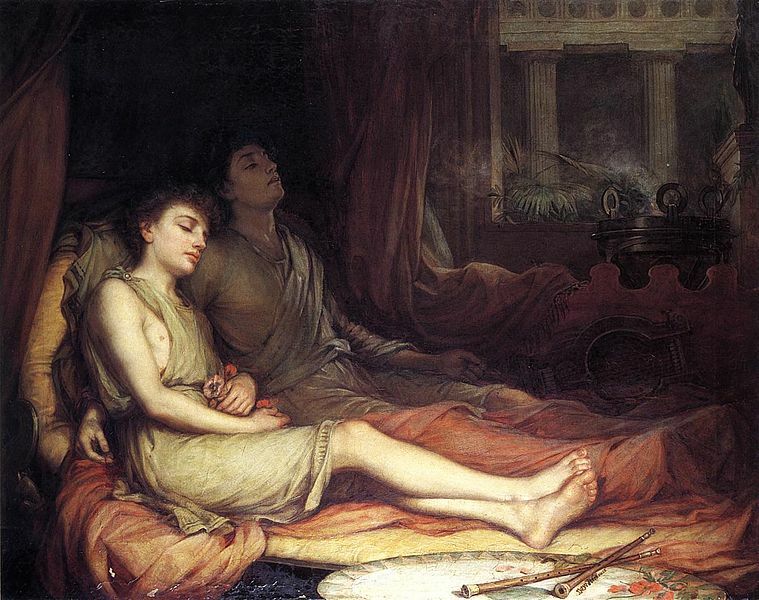 Nyx and Erebus were unsurprisingly parents to many “dark” deities, and famously Thanatos had a twin brother in the form of Hypnos, the Greek god of Sleep. Other siblings though also included the likes of the Moirai, the Fates; the Keres, the Death Fates; Nemesis, Retribution; Geras, Old Age; and Eris, Strife. Thanatos had a role of Psychopomp in Greek mythology, collecting the spirit of the deceased with his sisters, the Moirai, had decided that the life of the individual had come to an end. Thanatos would then ensure that the spirit of the deceased mortal was safely transported to the Underworld and the bank of the Acheron. There the spirit would be able to cross upon the skiff of Charon, as long as the person had been buried with the correct burial rituals. Whilst known as the Greek god of Death, Thanatos was particularly associated with peaceful death, whilst those who suffered violent death were more likely to be found in the company of the Keres, the Death Fates and the Hounds of Hades. In Ancient Greece, Thanatos was often portrayed as an elderly man with wings, with a sword in his hand or in its sheaf. It is therefore obvious why Thanatos is today often linked with the Grim Reaper of more modern mythology. Thanatos was an often mentioned god in Greek mythology, but the god of Death is particularly associated with three main stories. Arguably the most famous Greek mythological tale to feature Thanatos is that of Thanatos and Sisyphus. Sisyphus was the king of Corinth, but he had greatly angered Zeus, for Sisyphus was in the habit of revealing the secrets of the god to his fellow man. Zeus eventually tired of Sisyphus and decided he was to be punished, and Thanatos was sent to transport Sisyphus to the Underworld in chains. Sisyphus was clever though, and so when Thanatos came to collect him, Sisyphus outwitted Death. Sisyphus asked Thanatos to show him how the chains worked, and when Thanatos put the chains on himself, the god of Death was trapped, and of course Sisyphus refused to release him. With Thanatos in chains, Death did not come from anyone, and Hades found that no new residents were arriving in his realm, and Ares was observing battles were no one was dying. Ares himself went to Corinth to release Thanatos, and in the process Sisyphus was killed. Sisyphus had planned for just such an eventuality and had pre-warned his wife not to undertake the rites expected of a body in Ancient Greece. In the Underworld Sisyphus was at his eloquent best and managed to convince Persephone that he had to return to the surface world in order that he could scold his wife for not have buried him properly; and Persephone agreed to the request. Back on the surface, Sisyphus of course then had no intention of returning, and so again a god was dispatched to retrieve him, although this time, instead of Thanatos, Hermes was sent, and soon Sisyphus was commencing his eternal punishment. Sisyphus had shown that it was possible to outwit Thanatos, and Heracles showed that the god of Death could be outmuscled as well. King Admetus had once been an amiable host to both Apollo and Heracles on separate occasions. Apollo, as a result, had convinced the Fates that Admetus could avoid death if someone volunteered to die in his stead. When Thanatos came for Admetus at the allotted time, the king had expected one of his elderly parents to volunteer, but when neither did, Alcestis, the wife of Admetus volunteered instead. Admetus instantly regretted the arrangement made by Apollo, for he did not want to live without his wife. Heracles though was on hand to help. Heracles entered the mausoleum of Alcestis, and there encountered Thanatos. Demi-god would wrestle god, and eventually Heracles outwrestled Thanatos, forcing Death to released Alcestis; thus, Ademtus and Alecestis were able to live together for a while longer. Thanatos though is most commonly depicted for an event that occurred in the Trojan War, for during the fighting Sarpedon, a son of Zeus, was killed defending Troy. 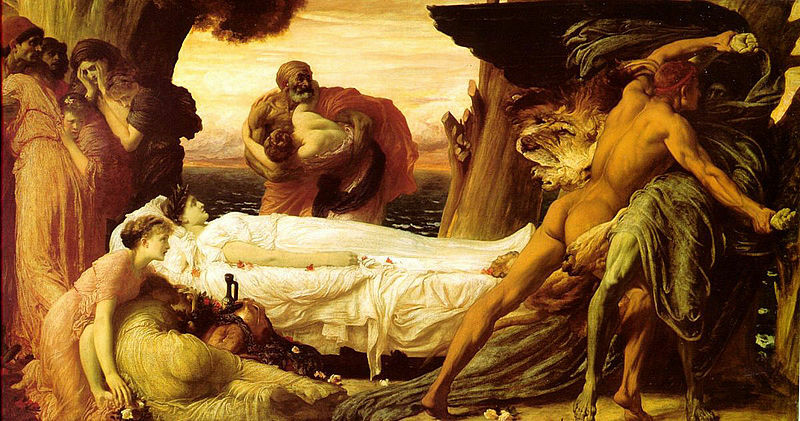 ​Zeus was so upset about the death of his son that he dispatched Thanatos and Hypnos to the battlefield to retrieve the body, and then transport it back to Sarpedon’s homeland of Lycia.